Angela Caputi Giuggiù’s innovative, elegant jewels are the perfect addition to the wish list of every woman. Featuring a blend of art and fashion, her creations are characterized by a continuously evolving creative process. Also known by the nickname Giuggiù, the Florentine designer has become a byword across the globe. Her stunning creations have been showcased at several of the most important museums worldwide. The creative heart of Angela Caputi’s bijoux is her workshop in Oltrarno, located in the picturesque Florentine district. Each and every one of her sought-after designs is handcrafted in Italy. 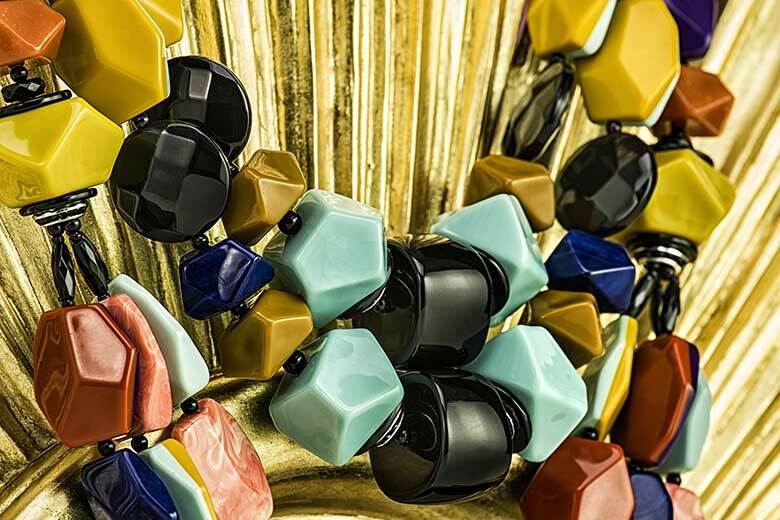 This season, the Italian jewellery designer presents a preview of ‘Arlecchino’, one of her striking collections for the upcoming spring/summer 2019 season. This collection includes a series of ‘bijoux’ focusing entirely on colour, a vibrant line featuring simple, clean-cut geometric elements infused with brilliant hues. A succession of brightly-coloured shades that are destined to become the key features of this summer’s outfits. This captivating, explosive combination of colours ranges from delicate pastels like coral pink, yellow and turquoise to stronger, more vibrant shades of acid yellow, violet, orange and lapis lazuli blue. Open Tue-Sat 10am-1pm and 2.30pm-7.30pm.